The Grand Canyon isn’t the only place in Arizona which features travertine – the limestone deposited by highly mineralised waterways. 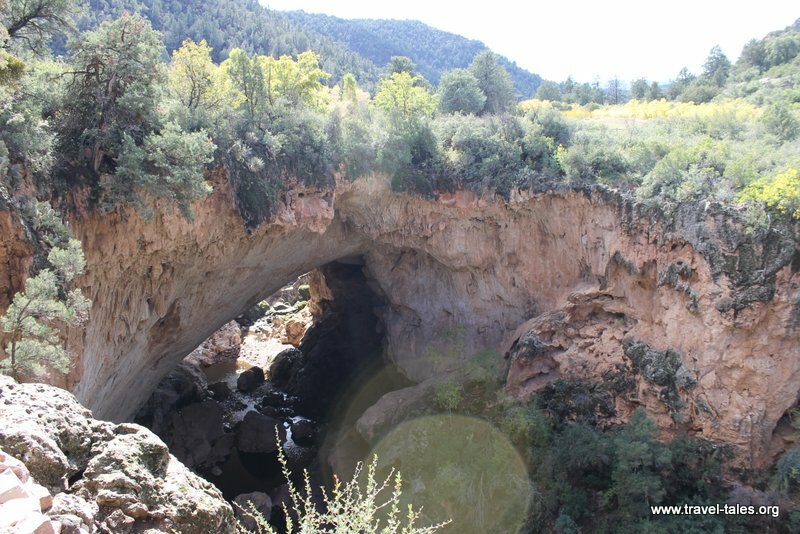 Pretty much right in the middle of the Tonto National Forest, equidistant to Flagstaff and Phoenix is the Tonto Natural Bridge. The Scottish explorer David Gowan documented its existence in 1877 and claimed squatter’s rights on the valley surrounding this geological marvel. The bridge stands 183 ft high over a tunnel about 400 ft long, which is 150 ft wide at its widest point. It is possible to walk close to the bridge and see the mineralised water which create the top layer still running over it. On the other side, there is a switchback trail taking your down to the water the runs through the tunnel. Travertine is fascinating to look because of it botanical appearance. That comes about from plants taking root in cracks in the deposit which water then runs over and deposits more limestone. Some of the plants in the Arizona State Park now surrounding the bridge area little further away, yet still striking.